Tilstock C of E Primary School and Nursery enjoyed a trip to the educational centre ‘Enginuity’ in Telford. Enginuity is a popular interactive design and technology centre providing a range of stimulating activities and a part of the Ironbridge Gorge Museum attractions. 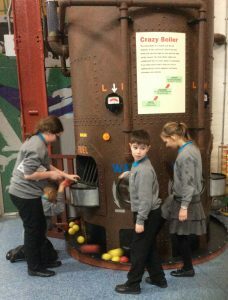 The children used their imaginations in the interactive Design and Technology Centre to pull a 10 ton locomotive and generate electricity from flowing water. They were able to test their co-ordination against the speed and accuracy of a robotic arm, build an earthquake-proof tower and experiment with an x-ray machine. The children enjoyed the water zone and were able to design and create robots. Mr. James Spicer, Head of School at Tilstock C. of E. Primary School and Nursery, commented: “It was a fantastic experience for the children at Enginuity, and it helped them understand a range of STEM related situations”.